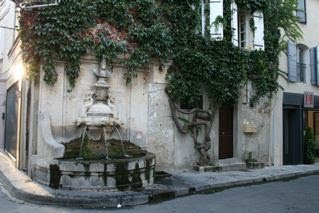 Too sick to to cook this week, I am taking you a weekend mini break in my favourite town on earth, St-Rémy-de-Provence. >As you might expect by the name, St Rémy is at the heart of Provence, southern France around 20km between Avignon and Arles. It has been home to Romans, Nostradamus, Van Gogh and Princess Caroline of Monaco. With chic hotels, shops and restaurants, St Rémy has an upmarket Parisien air. I have been fortunate enough to stay there around half a dozen times in the past twelve years and have watched it become even more well-to-do in that time. That’s not to say that it isn’t friendly or welcoming. No St Tropez snobbishness or disdain here. St Rémy is very down to earth and there are still a few scruffy buildings waiting to be renovated… but you’d better be quick! 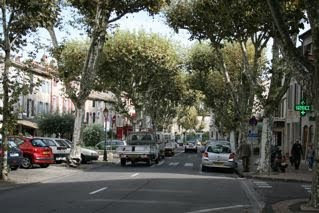 Small but perfectly formed, St Rémy forms a tightly packed circle around a single plane tree lined boulevard. With 10,000 inhabitants yet stuffed with maybe fifty restaurants, it is clear that food is high on people’s priorities here. The Wednesday market draws a huge crowd each week. >Our most recent visit was for 2 nights in September this year. I can show you round the hotel where we stayed and let you know about a couple of other places we have stopped in before. 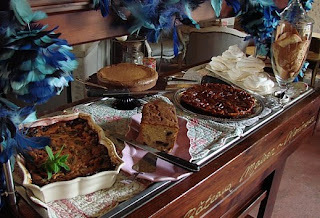 In a future post I will show you some places we visited nearby such as the Sunday Antique Fair at L’Isle sur la Sorgue. 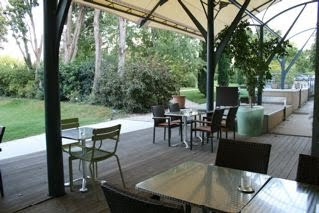 The garden at Hotel Les Ateliers de l’image >We returned to one of our honeymoon hotels; Les Ateliers de l’image. Initially a quirky three star hotel built in the shell of the town’s old cinema that made it onto the pages of the popular boutique Hip Hotels guide. The name means “Photography Workshop” and the hotel runs bespoke photography courses for groups. The owners later expanded the hotel into the long derelict Hotel de Provence on the nearby main boulevard around the town. With the large new wing came an expansive garden and new luxury facilities; suites, a larger pool, a sushi restaurant, even a tree house. We stayed in a room like this. 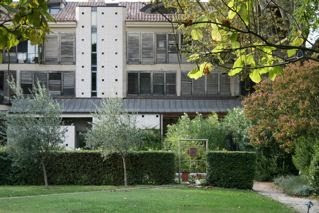 Standard rooms are from 165€ per night. 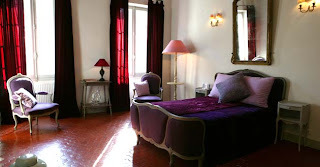 Superior rooms start from 300€ per night depending on season. 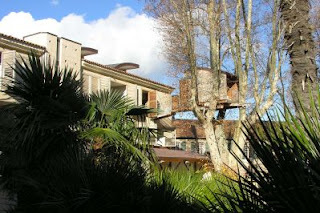 The Treehouse Suite is 300€ off season but I cannot say whether it might be bit draughty then! The lovely cocktail bar set inside the old cinema music hall building. We enjoyed fabulous glasses with Baileys in crushed ice here on our honeymoon. 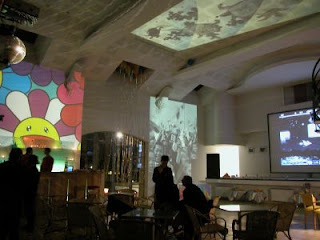 At weekends, they still show films in the cocktail bar. Above the screen you can see what was previously the projectionist’s gallery. 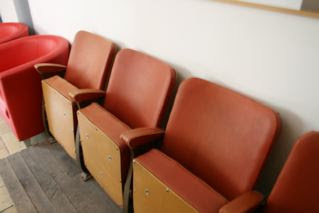 Ephemera from the hotel’s past remains; flip up cinema seating…. The new swimming pool. A private area surrounded by trees. Nice cold drinks to hand. The terrace outside the cocktail bar looking towards the pool area. A tunnel underneath leads from the road to the car park so not to upset the tranquility of the garden. >As well as photographers, the hotel is also popular with American cycle tours using it as a base whilst they explore the rest of Provence. 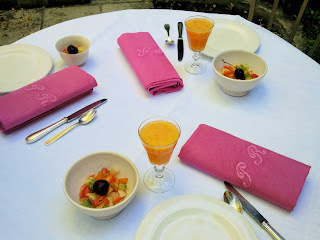 Should you find that Les Ateliers de L’Image is fully booked when you want to stay, there is another way you can access their pool and garden. 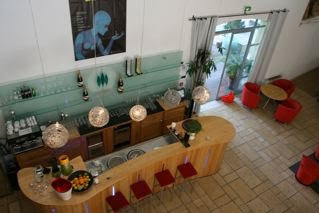 Guests staying at nearby Bed & Breakfast, La Maison du Village, are able to enjoy these facilities at Ateliers de L’Image for a supplementary fee of around 10€. 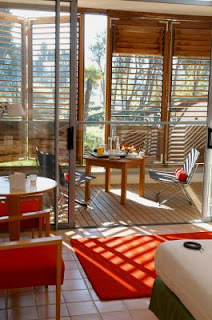 We stayed one night at La Maison du Village back in June this year, this time with our 2 year old son. 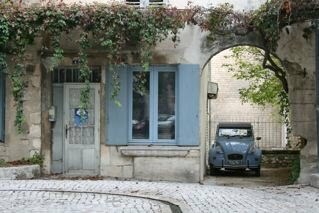 La Maison du Village is a beautiful old French house in the heart of the town. Rooms have huge high ceilings and period furniture. We were amused that our son had this huge room above, in their Violette Suite to himself whilst we were next door in the smaller adjoining room. 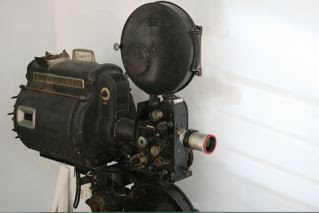 (We chose there as it had the television and we’d not disturb him using the bathroom!). Ted in the garden at La Maison du Village. The last place I will share with you today is Hotel Ville Verte which stands on the corner of a square where the Wednesday market is held. 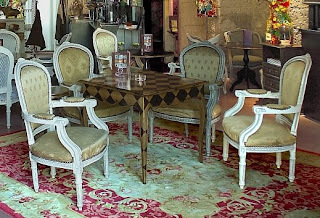 The interiors of Ville Verte are highly decorative and definitely not child friendly. Their website even holds the intriuguing warning, “Careful! for security reasons no babies or children or extra person are accepted in the rooms.” It says elsewhere that the hotel is not “adapted” for children although I think you would get away with a well behaved 8 year old. We stayed here for around five nights back in 2005. 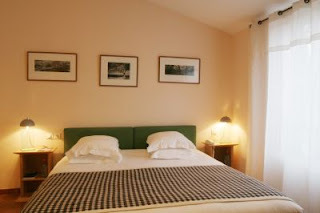 Their room rates are very reasonable 145€ considering the standard of the furnishings and the fact that Ville Verte is also one of the few places other than Ateliers de l’image with a pool and private parking in the centre of town. Our room had stone coloured toile de juoy soft furnishings and a little balcony. Breakfast is served in the tea room downstairs and it does feel a little like the set for Sophia Coppola’s Marie Antoinette with constant piped opera playing – possibly Gounod’s “Mireille” which was composed during his stay in the building. Amusing on day one, the tone of the tea room can grate towards the end of your stay – although the rooms, pool and service were faultless. 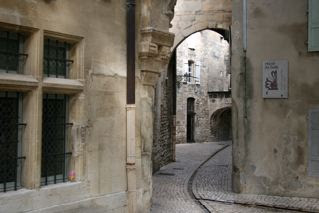 Streets near La Musee des Alpilles. The channel down the middle carries water through the town. 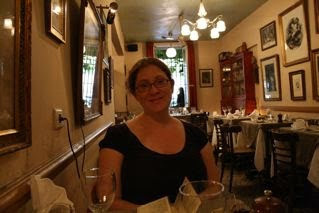 Me, sitting in restaurant, La Gousse d’Ail. 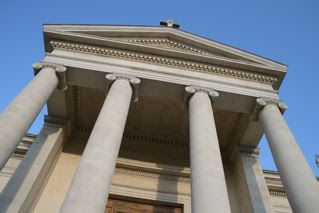 The joy of St Rémy for me is that such a little place should be stuffed with so much to look at. I haven’t touched on the shops, restaurants, museums and galleries nor history. I struggle to find a comparative destination in the UK and can think of only St Ives, Cornwall which shares an artistic legacy and also has narrow streets filled with artists galleries and shops. I hope you have enjoyed this little trip to France. I expect this will become an occasional series when I am too ill to cook but can share my tourist tips from my favourite destinations. Trains: TGV stops in Avignon and Arles. No station in St Rémy. I recommend hiring a car. Buses to St Rémy from Avignon are few and far between. 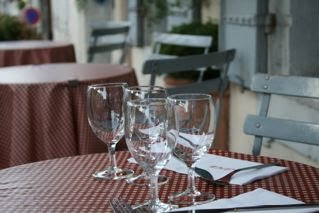 Need more travel tips for Provence, Cote d’Azur or elsewhere in France? Email me and see if I’ve been there!